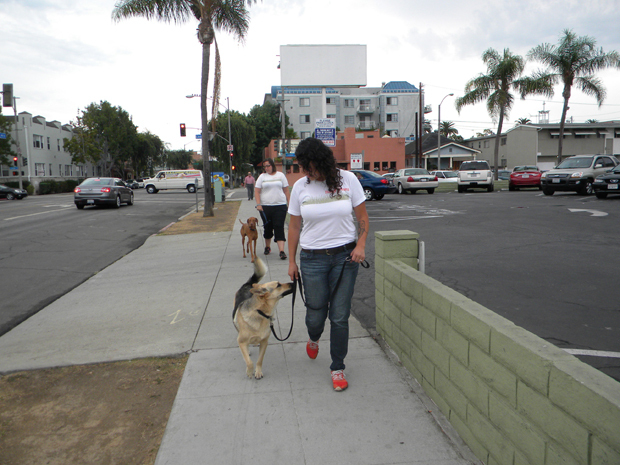 Itchy Paws co-owner Cynthia Lopez with team member Katie K.
Okay—you’ve adopted your best friend (let’s say it’s a dog). You’ve taken him or her to the vet and to lunch, bought special treats, and romped around the dog beach, and you both have sand in unmentionable places. Now it’s time for a regular walk—but you’re exhausted. And the little guy or the big guy or whatever size in between is all hopped up from the food and activity instead of ready for a catnap, or whatever dogs take. Who you gonna call? Meet Cynthia Lopez and Stefanie Villalobos, co-owners of Itchy Paws, a local licensed, bonded and insured pet-care service that does more than snap on a leash and walk around the block. Itchy Paws got the most votes in the Best Dog Walker Category in the Pet Post’s Pick of the Litter survey. My interview with Lopez took place a couple of days later than planned, as she and Villalobos had an emergency with a client’s dog and this took precedence, as any concerned pet owner would expect from a quality service. Itchy Paws comprises socialization, pet sitting, transportation, overnight care, dedicated exercise, grooming, and poop cleanup in the yard. Their services menu looks like the best summer camp or preschool you could ever hope to enroll your kid in. In fact, Lopez reminded me of a candidate for a camp counselor or teacher hire—and she’d easily get the job—as she answered my questions with assurance, knowledge and humor. Life partners as well as business partners, Lopez and Villalobos started up Itchy Paws in 2008 when they were looking for a way to spend more time together. Lopez was studying architectural and interior design in Santa Monica and Villalobos was working for a nonprofit, so their hours weren’t flexible. The company’s name was inspired by Lopez’s grandmother, who would use the term pata caliente—somewhat loosely, “hot-footing”—to describe Lopez and her friends’ activities when they were out and about. Pata also means “paw,” and “itchy” was the even looser translation for caliente that Lopez and Villalobos felt would be an attention grabber. They were correct—they’ve done quite well, and not just because of the clever name. 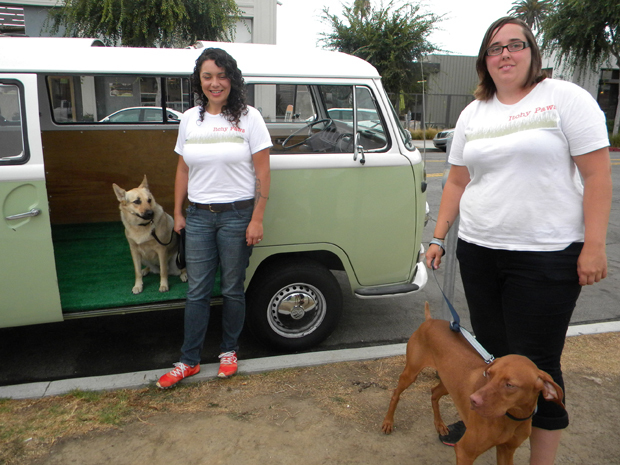 Itchy Paws now has five bonded employees working with the partners. “They’re all very valuable team members,” Lopez said. “They go through extensive training with us. Each of them has experience and also a passion and a love for pets. Itchy Paws’ walk and exercise routines are anything but traditional. The dogs are exercised and socialized, sometimes on the beach, sometimes skating (the walker, not the dog), other times running, until the dog is ready to go home. Then, there are the field trips. 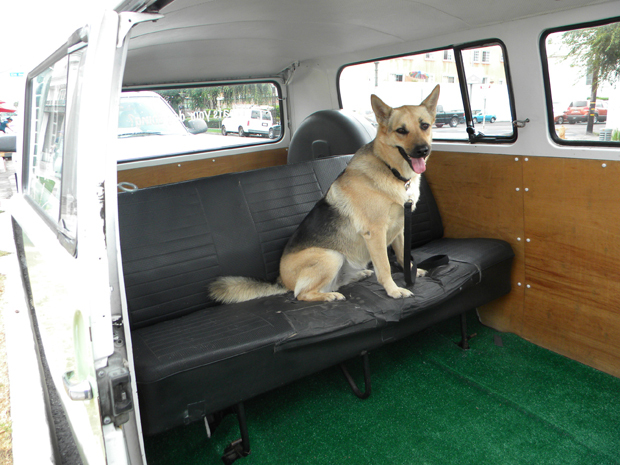 Anywhere from 10 to 15 dogs are piled into their Dog Bus and trundled off to one of the multiple dog-friendly hiking locations in the area to work out. It’s also a valuable opportunity to socialize multiple dogs. 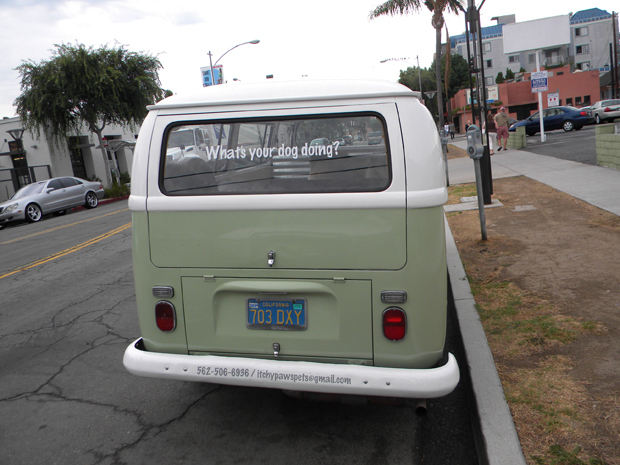 The Dog Bus is a light-green VW van that’s instantly recognizable by the Itchy Paws contact information on the bumper and the slogan What’s your dog doing? decaled on the rear window. “That’s in our next bus,” Lopez said. Sometimes, weather won’t permit hikes, but if a dog is scheduled for an outing, it’s in Itchy Paws’ policy to do an abbreviated version of the walk to give the dogs a potty break. And sometimes, certain dogs aren’t socialized—Lopez would add yet. “I don’t believe that there’s any dog who won’t socialize,” Lopez said. “If you can get to the root of the problem and see it from a certain perspective, you can help them work through the hurdles.” Lopez cited a senior German shepherd-boxer mix as her breakthrough. He was a rescue and had lived in a crate most of his life, and he was timid and fearful of most humans. There’s no cookie cutout of a person—or dog—who needs Itchy Paws’ services, Lopez says. There are dogs with behavioral needs from the aggressive to the goofily affectionate, like Henry, a collie mix who jumps up and wants to hug Lopez all day long as if they were at a high school dance. There are families who have to rush out of town and don’t know a responsible person to deal with the details and schedule. And vaccines are key, too—dog parks, Lopez said, are a great place for dogs to recreate and have fun, but socialization, as in any schoolyard, could involve passing germs back and forth, so immunization is essential. Walking the dog, I’m just a-walking the dog. Visit Itchy Paws on their website or Facebook page. Would you believe that they named this guy Fred Astaire? If he looks like any entertainment figure, it’s Scooby-Doo or Jerry Lewis, but no doubt that he’ll dance your way right into your heart if you meet him. 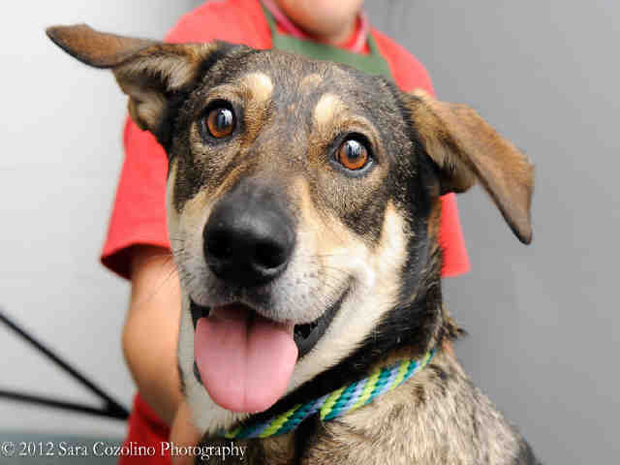 Fred’s a German shepherd mix about 2 years old, and he is performing presently at Animal Care Services, 7700 E. Spring St. in Long Beach, near El Dorado Park. Ask for ID#A475330. 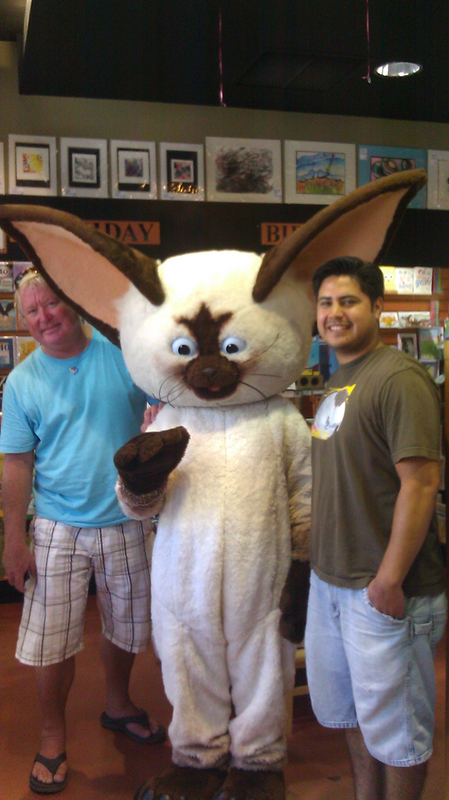 The beloved big-eared cat who claims Chihuahuas as his imaginary friends made a guest appearance at BelmontShore’s Apostrophe Books http://www.apostrophebooks.net/ on Friday, Aug. 31. The weather was paw-pad-scorching hot, and Chuck and Toby’s Scott Rinehart and groomer Ray Anguiano offered up a cool bath. Despite the affectionate hug (for the press, no doubt), Skippyjon assured the petmeisters that he’s self-cleaning, like all felines. Pet Appreciation Fair and WALK for the Animals, Saturday, Oct. 13, 9AM–3PM, El Dorado Regional Park Archery Range, 7550 Spring Street at the 605 Freeway, Long Beach. Parking: $7. Registration is now open for this annual Friends of Long Beach Animals event, presented by the Petco Foundation. WALK participants can strut their stuff for their Long Beach shelter counterparts and have a chance at winning great prizes! Participants and spectators will also enjoy exhibits, activities for kids, food trucks, vendors, judged pet/owner contests, canine demonstrations by So Cal Disc Dogs and Surf City Fly Ball demonstrations, and entertainment, including a special flash mob appearance by actress Megan Blake, who’ll have you dancing with your doggie. Preregistration includes the $7 parking fee. You can register or donate here http://folba.org/walk.html. All funds raised go toward low-cost spay/neuter and humane education. 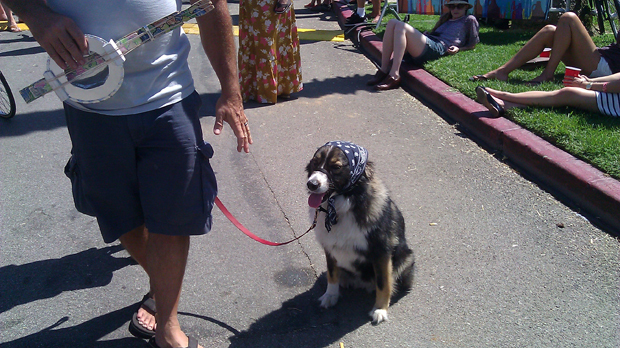 Bring your pet or come alone and enjoy this great annual event! ACS thanks everyone who provided donations for their wish list! The list has been further winnowed down; if you feel generous or just have any of the following items around your house, bring them to the shelter (and take home a pet, if you are so inclined!). Natural Balance Dog Food Rolls. See examples here. Two trash cans for our play yards that open with a foot press. See an example here. The Pet Lovers License Plate intended to provide a permanent funding source for spay/neuter, is building momentum. As of this writing, 5,011 plates have been preordered; 7,500 preorders are needed to begin production. The plate is designed by actor and animal activist Pierce Brosnan. Sporting one on your car will not only fund spay/neuter on a large scale but also will give anyone in your rear view the hint to help control pet overpopulation. For information and a look at the plate, click here. Funding and impact have been central to discussion for both the El Dorado Park Nature Center and the planned El Dorado Dog Park, both in the same area. Because both petitions have to do with animals, we’re offering links to signing both. Click here for the Dog Park petition and here for the Nature Center. “It was stunning, a glorious panorama rising two stories high. But it was like looking at a car crash. I found it hard to look away while being saddened by the death of so many beautiful creatures.” My friend Merrilee maintains a blog of her extensive and odd travels, titled Travels with Auntie Em, and this is her most recent, which displays what’s supposed to be impressive but impressed her in quite the opposite way. Check it out here.